I’m so excited to do another house concert with G. Love. I’ve been a fan since the mid 90’s and the last show we did was one of the coolest gigs I’ve ever been a part of. That one was with my friend, Graham Wilkinson. This time we get The Roosevelts who are equally spectacular. This is going to be a blast. 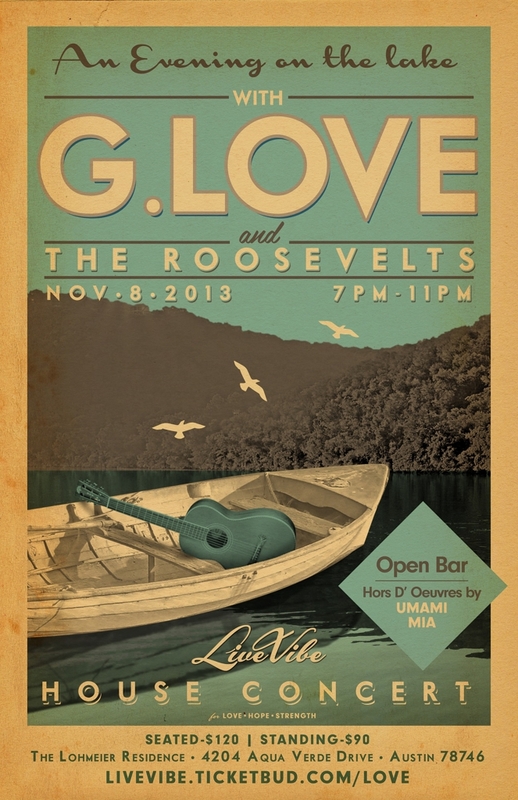 Be part of this intimate and private evening of music overlooking the cliffs of Lake Austin. Tickets are limited and include cocktails, wine and chef’s prepared appetizers by Umami Mia Pizzeria. Presented by Live Vibe. Benefitting Love Hope Strength. I will kick things off at 7pm. This show sold out last year so get your tickets EARLY! Wow! You get the coolest gigs.